Yeah, I totally agree on that. But being a mercurial figure, thats ingrained into his character. Something his opponents have also pounced on with their 'uturn' labels. And politics isn't a game of cricket where the situation changes every spell of play and you have to adapt, it works on sustainable statements. Something IK lacks in. His advisors should take note of this. That Army blunder, was particularly harmful. If there is one thing we know by now, establishment does play a role during government changeovers and IK wasn't doing any good to his party by slinging mud at one of its critical elements. If you want to enjoy power in Pakistan you should have the goodwill of the army, bureaucracy, judiciary, and the people. You can't go about committing faux paz against them with just weeks to go till voting day. Not unless you are on a suicide mission like Nawaz. Last edited by awan_from_soon; 9th May 2018 at 03:48. Yep, agreed. You got to maximize your chances and not minimize these. By the way, i have heard that Soan valley is very picturesque, would love some real pictures from you. Its Soon valley. Soan is a river in Pindi - the city I currently reside in. But that would be Sowa'n river. I am not just quoting news and making things up. I am involved in volunteering, and I am in direct contact with people who were there. PPP workers started it, PPP workers destroyed everything there, and PPP workers got Sindh police to join in. PTI workers may have thrown some stones back in retaliation, but it was largely the PPP workers instigating it and doing most of the damage. PTI Karachi leadership is incompetant, I agree. They have allowed PPP to leave this event completely unscathed. Things in Karachi have changed in just the last 2 months, I don't think this survey reflects the ground realities at all. I have volunteers all over Karachi who were also involved in the previous election too, and apparantly MQM does not have nearly as much support as the past. Middle and upper class areas like Gulshan, PECHS, Bahadurabad, Defense, Clifton are all for PTI. Then, areas like FB Area, North Nazimabad, Gulistan-e-Johar, Shah Faisal Colony, Model Town have significant PTI support, and MQM are in for a rough time there, PTI may even win. PTI UC presidents in Orangi Town have done a lot of grassroots work (often wihtout the backing of Karachi leadership), and we have a serious shot at winning that seat. I wouldn't trust surveys done in Pakistan, they have never been accurate. I would only start trusting them if they turn out to be accurate for 2 elections in a row at least. This is inaccurate and skewed, PTI was prominent even in these areas in 2013. I know this because I have relatives all over these areas, and I myself was giving vote in PECHS Block2 where almost everyone I know in line with me was voting for PTI. Point is Karachi is a population of 3 crore, and even if all these areas vote for PTI, MQM has a BIG voter bank that still exists and will vote for them, MQM will lose seats but will still manage to win around 9-10 seats out the 18 in Karachi, and majority in Hyderabad how many they have. Last edited by waleed88; 9th May 2018 at 04:49. I know they had PTI support last time too, but the people in those areas are giving me feedback that PTI have a lot more support than last time in those areas. Add to that the fact that there was widespread rigging in Karachi last time round. I'm originally from those areas, I have family there too. I never said MQM are dead, but they are definitely going to lose a lot of seats to PTI and even PPP and PSP. I think they're only going to be able to retain 9 or 10 seats. PTI have a decent chance of winning 5 seats, PPP might take 2-3, PSP 1-2. Last edited by hussain.r97; 9th May 2018 at 04:56. PTI is the worst party to ever come in Karachi, they and their leaders only mobilize when they are ready to fight elections, that is the only time they come to Karachi... they coudln't manage any big wig from any polticial party in Karachi.... besides Amir liaquat Hussain... they are biased enough to only come in when its time for elections and act all prominent and important. Last election of PS-114 happened in karachi and PTI didn't even manage 10,000 votes. In an election where Saeed Ghani won the votes. Everyone from PTI's top leadership, A class leaders and even Khan visited the area before the election 2 days before, and PTI failed so hard its not even funny. Lets not forget the battle in the NA-248 Azizabad or how miserably PTI failed to win one seat in local body elections. Even that was dubbed a 50:50 as per majority media outlets. PTI's leadership's only worthwhile candidate from the whole of Karacih is Amir Liaquat (the guy who turns every few days), is the only guy that resonates with the mases. These rich baap kay baitay Ali Zaidi, Imran Ismail and Faisal 'heavybike' Wawda have nothing on them to show for the people of Karachi. They are just hot air, and try to do the best Imran Khan impersonation on TV possible, thinking this acting might eventually end up gettting them votes. For once I agree with Waleed on every word he has written in the above post 330. In Karachi political dynamics are different. I have to agree with most of this. Karachi leadership is as incompetent as it gets. None of them are interested in grassroots politics, they all think that "Karachi is educated, they will vote on ideological grounds". They are absolutely out of touch from the ground realities. Our workers have tried pushing them so hard to get them out, do some more grassroots work, but in their own words "it's not needed, you need to focus on propagating PTIs ideology." They are totally unwilling to even visit people in the streets. The only person getting out and doing corner meetings and such things is Amir Liaqut. Last edited by hussain.r97; 9th May 2018 at 05:07. They are not government. But they should have organised their own party to convince voters. Infrastructually as a party at the grass root level. Maybe Amir Liaquat might be able to rally some voters.... if he remains dedicated to the cause. The other thing is that they have not brought a single capable person from the lower ranks to the forefront? These are all old faces, practically a selfie group. There has been no new addition in the top leadership of Karachi. Except Arif Alvi to a little extent, i have not seen this Naazuk group doing anything worthwhile. And that ends his contribution to the party. Interesting to see nobody yet mentioned Haleem Adil Sheikh! The guy is proving to be an asset for PTI in Sindh and a bit of Karachi since he joined them back in 2016 and did far more in last 2 years for PTI than the selfie group called Karachi leadership of PTI. Haleem Adil Sheikh was PML-Q Sindh president before joining PTI and he isn't given any bigger role in PTI yet but still he is very active and doing good work at ground. He should replace Arif Alvi as PTI Sindh President. Arif Alvi can only be an asset as a legislator he isn't made for ground work. There are few issues with such surveys so they can just be used as indication. - It's usually conducted in markets where you see lot of shopkeepers and small business owners but hardly any women or youth (who make huge numbers of population). - Hardly anyone ever mentions name of Independent candidates (or small parties) who may play a huge role in many constituencies. - Question Habib Akram asks also may not get correct answer, rather than asking who do you think is likely to win may get different answer to who do you think should win. For example, in Punjab PMLN dominates so most people usually say "Lagta tou yehi hai Noon jeetay gi" or "Noon ka hi zor lagta hai". This could purely be based on their observation so can't be taken as confirmed vote. In Mansehra, i have heard Captain Safdar has done lot of development work with his father in law's help with funding but PTI this time is banking on their reforms which seems to have impressed a lot of people. 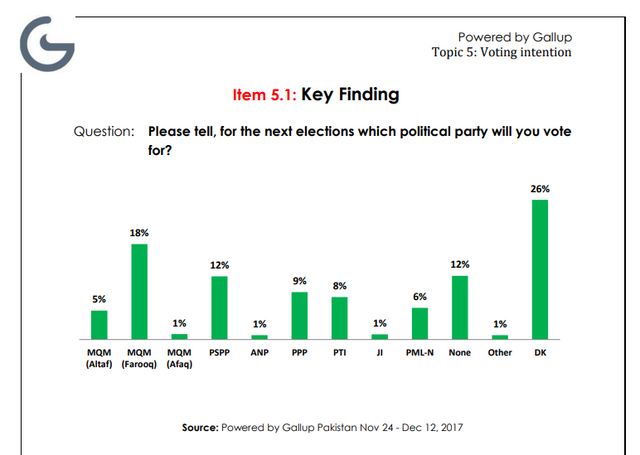 Last time it was PMLN win by HUGE margin but despite survey results, i think PMLN still is ahead by 55-45 but PTI may change this during campaign. PMLn's Sardar Yousuf hasn't lost an election since 1985. PTI and JPSM Merger after a written agreement on the creation of South Punjab province. Well, if I am not wrong, these regions represent the Eastern side of Karachi where PTI polled 40k+ votes on NA seats in 2013. Then there was this whole wave of PTI public support - now I don't see it. Last time PTI conducted packed jalsas in Bagh-e-Jinnah. Now they are looking for tiny grounds in Gulshan-e-Iqbal. There is a reason for that - waning popularity and the ensuing lack of faith in filling a larger area. As for rigging, I mean MQM would have rigged a lot but still not all the votes polled for them should be considered as stuffed. They have a very wide support base in Karachi. A support base that would be much more likely to brave the July heat and cast their votes than the people from upper middle and posh areas of Karachi where PTI finds its keyboard junoonis. The point being, PTI has failed to achieve a grassroot popularity in Karachi despite the encouraging mandate they were handed in 2013. The main reason being completely ineffective local leadership. Amir Liaqat is the only local leader that is working on the mohallah level, the other leadership is sitting in their air-conditioned rooms and expecting miracles. Call me a pessimist, but apart from ALH, Imran Khan and maybe Arif Alvi, I don't see anyone winning on PTI ticket in Karachi. Hopefully, after winning from more than one seat IK won't relinquish the Karachi one, otherwise PTI's tally from the city would be just 2. In conclusion, I have learned a lesson from my starry-eyed optimism back in 2013. Now I am looking at things a lot more realistically. Yeah, HAS is a hard-working fellow. Very active but sadly not an electable, maybe a fighting chance in NA-258 (old)? The last time he contested elections, he got less than 1000 votes in a NA contest. Yea not an electable but he is one of those guys who can work on ground for party and be rewarded senatorship or other higher posts within party later. Most electables don't have the passion to work for party because they just have to secure their seat to remain in good books of party. 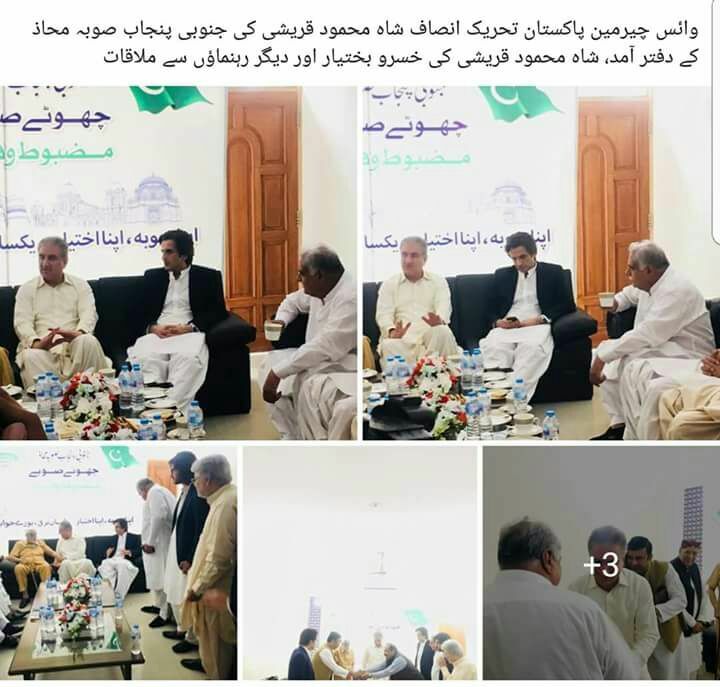 Why Shah Mehmood wasn't in PC and Meeting with these JPSM guys today? some issues within JKT and SMQ? Yesterday both SMQ group and JKT group were taking credit for these new joinings. This is the effect of stuffing several talwars in a nayam. Most of these South Punjab politicians are not on good terms with each other. And with the addition of JPSM into PTI, things are getting more crowded and the ideological group that was with the party in these South constituencies in 2013 elections is feeling sidelined. Back then, SMQ had single handedly constructed the South Punjab panel and it performed very well electorally in the districts surrounding Multan. I am sure he is not feeling too good about all these JPSM politicians crashing in. For one, they won't be as loyal to his leadership aspirations. Or I may be reading into it too much. It might just be that SMQ has done work in reeling JPSM in but JKT is hogging all the limelight. Agreed. But I see his Twitter feed and his doing a lot of public contact work. I am sure he can do reasonably well on a NA ticket as well. May not win it, but will get a decent number of votes on the Gadap seat - an unwinnable one for PTI. But he was there yesterday meeting them and taking credit but today he wasn't in PC. Pics from yesterday meeting. Maybe he should be given chance as a MPA under a strong PTI NA seat of Karachi? Agreed on the JKT part. He has been very active in fishing for electables. On the pictures, I think this is just a photo op to take some credit for the writing on the wall. The thing is, he is Sindhi and very active in the Gadap area since 2008. His best chance is only there. The Gadap seat is mostly won by Balochs but Sindhis do have a fair share of population there as well. Yeah. And the constituency hasn't changed much in the new delimitations. Apart from now being numbered 236. But, even if he doesn't win there, I am of the opinion that instead of throwing him into the Karachi proper cauldron, PTI should let him stick to his guns in NA-236 and contest on it and a PS seat under it. Agree with you. Don't you think Mirza family joining PTI will hurt PTI votebank in Karachi? Mirza is known as Anti Muhajir and was offering open support to layari gangs and uzair baloch types in PPP govt. He always gives justification that I'm myself Sindhi Shia but both my daughters are married to Urdu Speaking Sunni families and then he turns around and gives worst abuses to urdu speakers. I hate this animal. @Mian sahab so the Janoobi Punjab subah mahaaz formally joined PTI today, but all analysts saying it is pretty much in vain because PTI would need 2/3 majority in parliament AND 2/3 majority in Punjab to form this province, which is pretty unlikely (or maybe impossible)..... so this same group will turn against PTI when they are unable to make the province. You need 2/3 votes , it could come from other parties too. PTI has promised to work for it, if they are unable to get enough seats themselves and support of other parties to turn into the reality, it does not mean the promise is not kept. Nevertheless, it helps in creating a wave for PTI. It will also force the Nooras and the PPP into a corner as both have used the Southern Punjabis in the past with promises they never ever mean to fulfil. Remember the Nooras and Showbiz promised this in the last election. Yeah, but given PTI's chances in Karachi, I'd rather take a sure shot Badin seat (or maybe two!) than think about how the Muhajir community will perceive him. As I have mentioned above, I am expecting no fireworks from PTI in Karachi. At best 3 seats - AA, ALH, IK. Good. He also supported PTI in the 2013 elections. Very popular in the Potohar belt - one of the reasons of PTI's great showing in the region back then. Also, there is news circulating that Rana Umar Nazir from Gujranwala will join PTI tomorrow (his family hasn't lost an election in the city since 1997). With Mian Tariq Mahmood and Ahmed Chattha already in the bag, PTI is looking to win at least 3 of the city's 7 seats. Mian Tariq's seat is not confirmed yet. He faces a stiff competition from either law minister Mehmood Bashir Virk or defence minister Khurram Dastgir. PML N is very strong on couple of Gujranwala city seats, where as on other 4-5 it will be neck and neck. Mirza is a known anti-Muhajir bigot, him joining PTI will definitely hurt their chances in Karachi. Also this would give MQM the opportunity to say that they were right all along and PTI cannot be trusted. Is he confirmed to join? could be suicidal for PTI's chances in Karachi imo. Not confirmed about the current delims, but aren't their constituencies different from Mian Tariq's? Last time his was NA-98, Dastagir's NA-96 and Virk's on NA-97. While they are contiguous but the latter two fall in the municipality of GJW and Mian Tariq's is on the city outskirts. Gujranwala lost one seat and Mian Tariq's constituency has been absorbed into others. Well that's unfortunate. Interesting that only the defector's seat was expunged. Mian Tariq left PMLN on February 27 and his seat was no more on March 5. Hmm. PTI's situation very positive there as well. Glad to see people there are talking about PTI's environmental work as well. Sometimes, I wish the whole country should vote like KP/Hazara. The whole program didn't air due to Showbaz's speech in Nankana. At least 50% responses were in PTIs favor for the part that did. I could be biased due to being PTI supporter but i really find people of KPK lot more politically mature than rest of country. Nowhere in Pakistan do you see people talking about institutional reforms, health, education and even tree plantation. It was brilliant to hear few people from place like Mansehra appreciating Billion tree project and even Habib Akram confirmed the trees now exist where there was nothing few years ago (Some people doing propaganda despite appreciation from locals and international organisations should really feel ashamed). I think PTI has made significant gains in Gujranwala and will win 50% of seats there. Overall public is still 60-40 in PMLN favour but this could change with influential candidates moving towards PTI. Faisalabad is another PMLN stronghold where PTI has lined up quite a few strong candidates and may surprise them with 4-5 seats. Sheikhupura also is very strong for PTI. Pothohar region was quite pro PTI but i think PTi may gain more seats than PMLN overall this time around. PMLN still have upper hand in Okara, Kasur, Jhang (this could change), Gujrat (alliance with PMLQ could help). Strength in South Punjab makes up for weaknesses elsewhere so overall i see neck to neck battle in Punjab unlike 2013. Exactly. This is the reason why they voted PTI back in 2013 while the rest of the country preferred Nawaz and Zardari fiefdoms. Hopefully, this time around some sense is knocked into the Punjabi and Sindhi voters. PTI are holding a jalsa in Bagh-e-Jinnah sometime after Ramzan. These small jalsas in Karachi are just a leadup. Two MPAs, one MNA from N-League join the PTI today. PML-N is falling like a deck of cards.Good times ahead. You are missing Fehmida Mirza and Zafar Ali Shah from Sindh. I'd also put more seats from Karachi, but that's my opinion. Great post and agree with most of it! I always thought Gujranwala being PMLN fort as well but I have seen decent support from Gujranwala for PTI and some heavyweights have joined PTI as well. Bilal Ijaz, Ahmed Chattha, Tariq Mahmood and Rana Nazir are all in very strong position. There is one less seat but voters won't disappear so they can still win other seats unless their strong areas go to other constituencies. Sheikh Rasheed can also get disqualified and he wants to contest on 2 seats, PTI wants to give it to Fayaz Chohan so let's see. I agree with your overall assessment as well, i was giving them around 75 seats before JPSM merger, now they can get a few more and may even get 90. Really well balance argument, agree with most of your points. I think things are going to change quite significantly, looking at the rate electables are joining PTI. 2 sitting MNA and 1 MPA from PMLN joined PTI today. (Gujranwala and Khaniwal). Mirza family from Sindh is joining on 14 May. In north Punjab PTI was really weak in Chakwal but now there are reports of Sardar Ghulam Abbas joing PTI again and Faiz Tamman is interested too in joining so i can see PTI winning 1 out of 2 seats from Chawal and 1 out of 2 seats from Attock. They will do same in Jehlum too by winning at least 1 of the 2 seats out there. Nawaz Sharif need to realize North Punjabis love Pak Army and there is a jawan from every street of Attock, Chakwal, Jehlum and Rawalpindi in Pak Army you can't sell this anti army narrative there they are not going to listen to this narrative and Nawaz Sharif got the idea in Jehlum jalsa when people refused to appear there. PMLN Senator from Chakwal is an ex-General, Their current MNA from Chakwal is a ex-major and PTI's most strong MNA candidate from Attock is a retired major too and 2 of their MPA are ex colonal and brigadier that gives you the idea of Army influence in North Punjab. Last edited by Mian; 10th May 2018 at 16:31. Ok chaps can somebody revise @awan_from_soon very good post above with a new estimate based on some new comings into PTI? 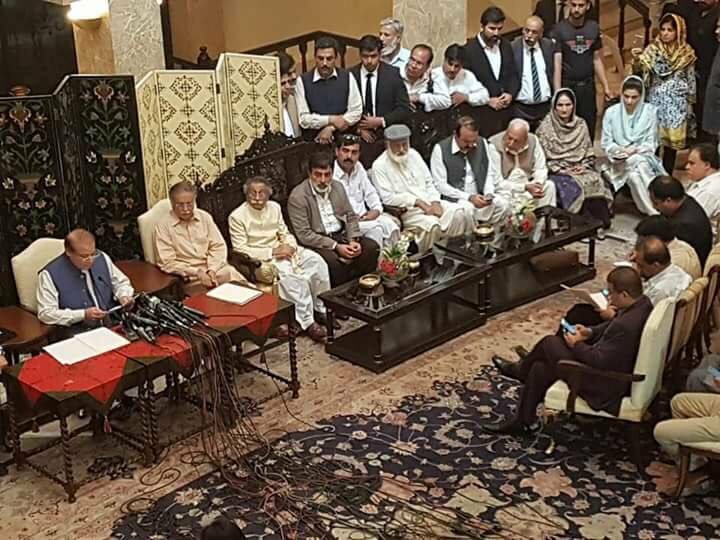 What do the PTI need to make a govt at this moment in time and what do we think they will need to do to secure the PM and key positions?? Independent MNA Raza Hayat from Khanewal joins the PTI. It is a confirmed seat. This man was out 3 tiems PM and he can't even answer simple questions of his own paid journalists without reading from perchis? @Mian did you see what is happening there? Exactly as we suspected with this so called $4Billion money laundering to India. He is a duffer but knows where to put his money and not that stupid to send money to India knowing well kind of storm it will create. This guy never comes on media to defend himself unless courts force him to so how come he comes in front of media within a day. Did he react to Asghar Khan case? Isn't it the biggest case in history about his narrative "Vote ko izzat dou"?? Come out and defend yourself, face the media and we will know how much inqilabi you are. This was FIXED allegation, purposely bowled no ball and that too a full toss. This way he can claim that all NAB investigations are just to trap him and he is honest. Rauf Klasra also mentioned something similar that certain elements in NAB are Nawaz's patwaris and this plot is hatched by them to discredit NAB. It is ironic that Nawaz is asking NAB chairman to resign within 24 hours when he himself clung onto power till he was booted out by the honourable Supreme Court. The current most critical issue for PTI is the burgeoning number of newly arriving electable in the party. New joinings are not necessarily good because PTI's old guard, particularly those who were with the party pre-2013 or have joined until 2014-15, will be very threatened by this barrage of 'preferential candidates'. Nowhere is it more evident than South Punjab where PTI is essentially split down the middle between SMQ's group and JKT's group. SMQ was one of the major architects of PTI's South Punjab panel in 2013 elections and it performed very well in Multan Division. Now with this deluge of electables joining from the area, the balance is upset. There are 2-3 candidates per seat. And no one wants to cede ground to the others. While PTI is making all NA ticket applicants sign affidavits for not contesting independently in the event they don't get one, that won't stop these leaders' lower hierarchy from sabotaging/not supporting the ultimate ticket-holder. PTI very delicately poised in Punjab, particularly South Punjab. The entire leadership should cognizant of this situation and work towards compromises. Not every new comer should be given a ticket. This is why, in my estimate, I put PTI at 30 seats in SP - while it is in a position to get around 35-40 seats. Infighting and grouping is driving their attainable seats down. And if PTI doesn't do something to resolve the differences that rising with each new-comer, the party will dilute itself to less than 20 seats. Last edited by awan_from_soon; 10th May 2018 at 18:45. Why should we make him realize a shortcoming that is working for us? IK said in an interview that you can be ideological member of PTI but if you don't know the science of running for and winning elections then aisi ideology ka achaar dalna hai? For every election you need 2-3k polling agents at polling stations, camp sites, bringing people to voter booths. The ideological members generally can't afford to do so. Pakistan is not in Europe where people will vote for ideology. This is the difference between KP and rest of the Pakistan voters. There are only a couple of seats in KP where a family or a person win every election that includes Sardar Yousuf seat otherwise no matter how powerful you are its pretty hard to win twice in a row in KP for any candidate. ANP lost the seat to JUIF from their fortress charsadda in 2013 and guess what PTI wasn't even in the compeition there but now in 2018 same seat is looking like a contest between PTI and ANP. Same goes to Maulana who lost a seat in DI Khan his fortress and even the most secure seat of JUIF in Bannu is looking in danger. He said the same thing to Gilani whose crime was FAR less serious than Nawaz himself. I have ZERO doubt that this was a fixed allegation otherwise you would never see Sharif coming out within hours clarifying his stance. If he stays in politics somehow, he will go against EVERYTHING he stands for today. The man is selfish, dodgy, greedy and way too arrogant (don't have any qualities for such arrogance either). While you are correct, but my statement was not referring to the ideologues - people who can't even win 3k votes on a NA seat. I am talking about established candidates. Look at PTI's results in areas around Multan. These are not mere old members but through and through electables given the current state of PTI in SP. Where would these guys go when the opportunist preferential candidates keep coming in? I am sure some would concede and work for the party, others would fight and may migrate to PPP/PMLQ/PMLN. There is a legal lacuna in PTI's NA-ticket affidavit which only prohibits unsuccessful applicants from contesting independently. It can easily be exploited if these disgruntled individuals join another party. Thus taking their personal votebank with them. I used to give full support Fozia Kasur for her work in party and still respect her for all his efforts in SKMCH fund raising but she as a political leader of PTI lost all respect in my heart when she had a dig at Asad Umar in an interview recently saying PTI imported him from Karachi. Maybe she don't know how much work Asad Umar done in his Islamabad constituency and looking all set to with it again with a heavy lead and it Asad Umar also did a very strong campaign for PTI in LG elections of Isb. True and Asad also worked in Karachi and in labor unions on party instructions. I believe Asad Umar also had a hand in arranging this support from Pir of Golra recently.